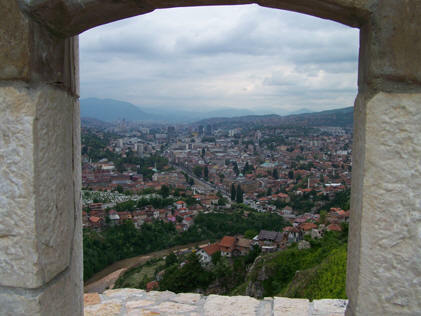 This article covers the Editor's tour of Bosnia and Herzegovina in May 2006. Whilst Bosnia and Herzegovina (BiH) is making a good recovery from the recent conflict the signs of war are all around in the bomb damaged and bullet scarred houses in village and town alike. Tourism is developing fast in a country of outstanding natural beauty that has much to offer any tourist (travel details and recommendations at the end). 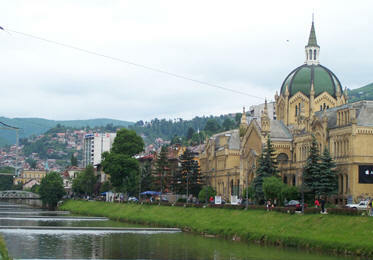 This country has been the meeting point of civilisations with a unique heritage that mixes Islamic, Orthodox and Catholic cultures. For the military historian the main attractions are the fine medieval castles and this is reflected in the pictures below. 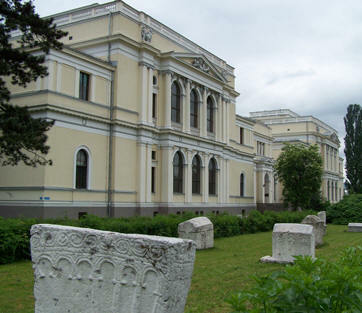 Bosnian, Austrian and Ottoman influences can be seen in them all. Some are well preserved, others require a bit of effort - and leg work! I hope this short guide encourages others to make the effort. You won't be disappointed. We flew into Dubrovnik airport and hired a car from there. 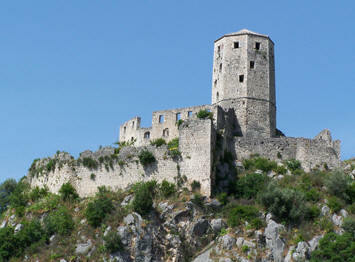 This also gives some options to visit the sites on the Dalmatian coast if you have time. First stop inland is the Turkish fortress of Hadzibegova Kula near the village of Hutovo (near a famous bird reserve if you have a non-historian partner to please!) that defended Ottoman territory from Venetian incursions. Mostly a ruin but the view from the road explains its position. 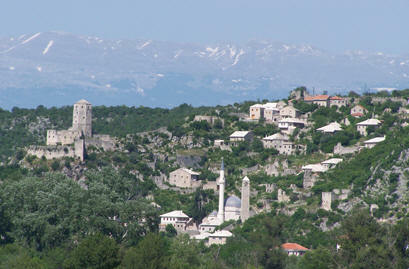 The main road from the coast to Mostar (M-17) runs past the old Turkish town of Pocitelj. 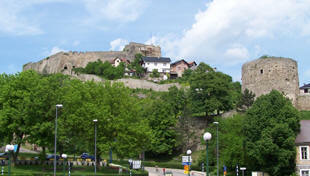 The town is dominated by the Sahat Kula fort built into the old town walls. Just before Mostar is Blagaj. 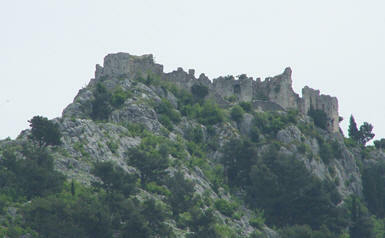 On the cliffs overlooking the village is the fortress of Herceg Stjepan who ruled Hum (Herzegovinia) before the Ottoman invasion. 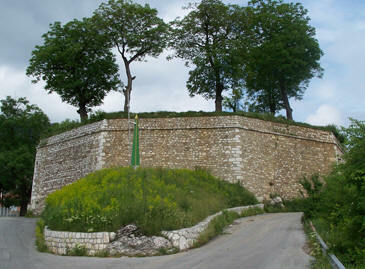 Originally an Illyrian and then Roman fort it was further improved by the Ottomans. 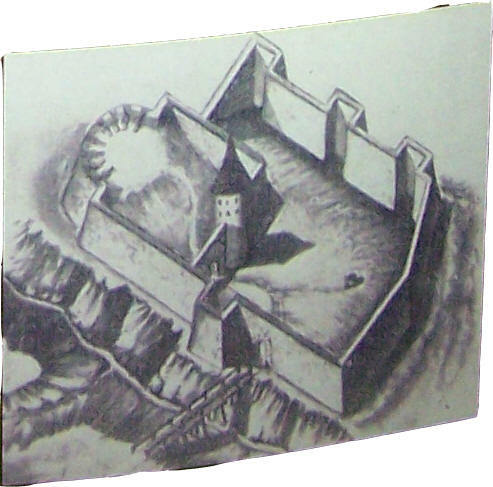 As the castle is an hour's steep climb the main tourist attraction is the Dervish tekija (similar to a monastery) built into the cliff at the source of the River Buna and the adjacent trout restaurants. This is a beautiful spot for lunch and lots of interesting Ottoman souvenirs in the tekija. Then onto Mostar the centre of Ottoman rule in Herzegovina. The main feature of the old town is the famous bridge that that was blown up by Croatian tank shells in 1993 but now reconstructed. 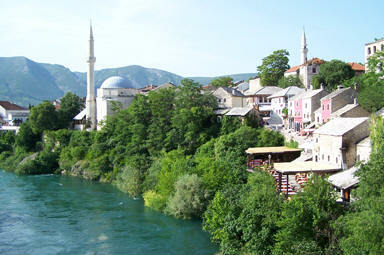 Despite the war damage the old town based on the River Neretva is stunning with its bazaar and mosques. The metalworkers have even turned the thousands of shell casings into souvenirs. However, on your return be prepared for an explanation at airport security! 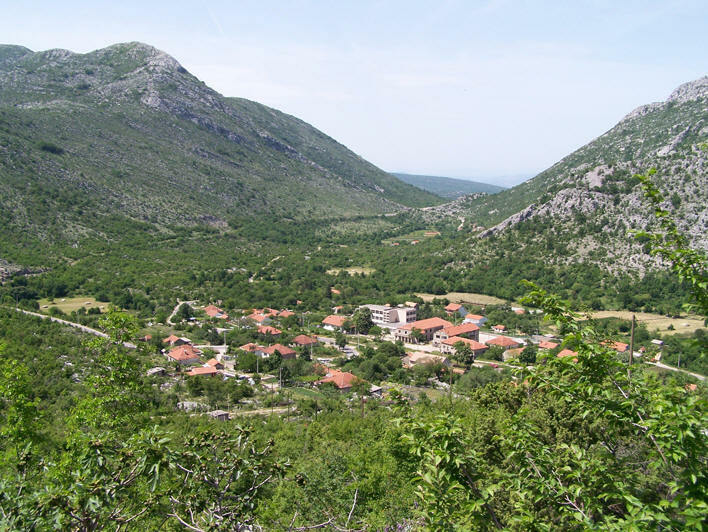 North of Mostar on the Sarajevo road is Jablanica, site of the WW2 Battle of the Neretva. 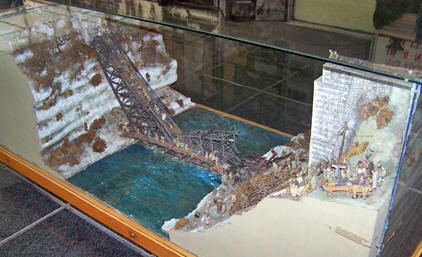 The partisan 'victory' was achieved by escaping the Axis net by crossing the downed bridge. There is a large museum with I am sorry to say very few exhibits. 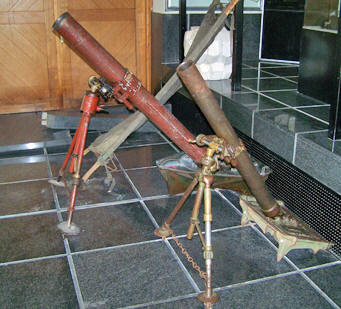 I suspect some of the armaments came in useful in the recent conflict. You can stop for a drink in the converted German bunker although most visitors are attracted to the town by the ten roadside restaurants that serve roasted sheep over open fires. To be avoided if your partner is a veggie! As you pass through the impressive Jablanicko Lake system and the river gorges either side you could be forgiven for thinking you were in Austria or Switzerland. Next stop is the capital Sarajevo. Again recovering well from the 1400 day siege between 1992 and 1995. 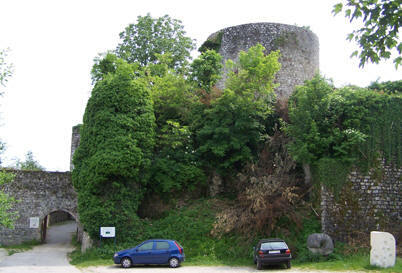 Military history sites include the Eugene of Savoy Castle, presumably named by the Austrian's as the great general only stopped long enough in 1697 to burn the city down! 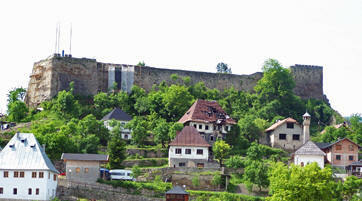 The castle is being reconstructed but it provides the best views of the city. Then there is the site of the assassination of Archduke Ferdinand and his wife in 1914 that at least arguably sparked the First World War. 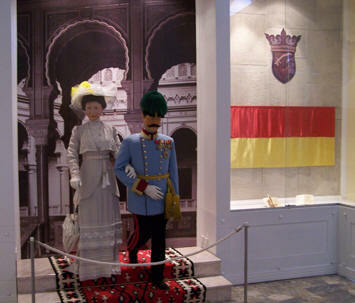 There is a small but interesting museum with period plates and uniforms. The National Museum is worth a visit, particularly for the medieval exhibits and their plans for the restoration of sites throughout BiH. The old town with its bazaar and mosques mixes easily with an otherwise typical modern city. 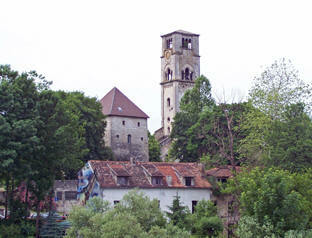 Heading north from Sarajevo into central Bosnia the first stop is Travnik the HQ of the early Ottoman rulers. 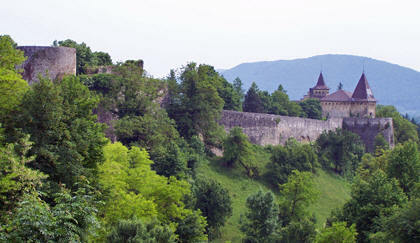 Situated in a narrow river valley the highlight is the well preserved castle that dominates the town. There is a small museum inside. 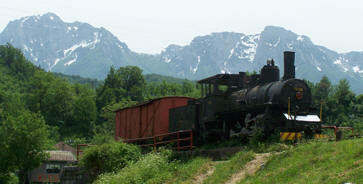 Next stop north is Jajce. A much fought over town as befits its central strategic location. 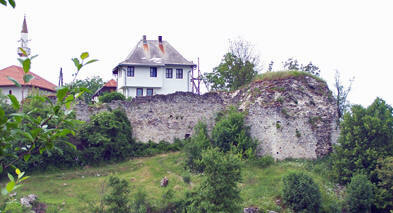 This was the last Bosnian castle to fall to the Ottomans in 1528. 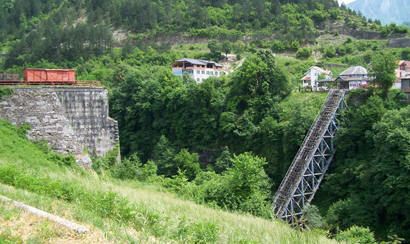 It was a partisan base during WW2 and was captured by the Bosnian Croat army in 1995 at the end of the recent conflict. 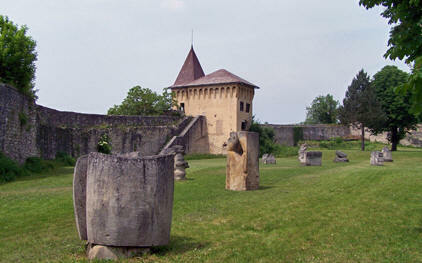 The castle is still in reasonable condition and is being repaired. 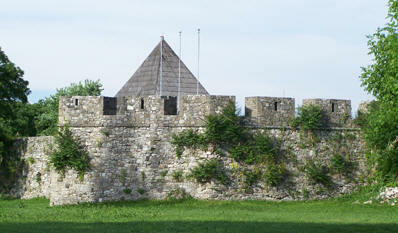 As is often the case in BiH there are houses built right up to the castle walls and sometimes even inside (see Pecigrad below). 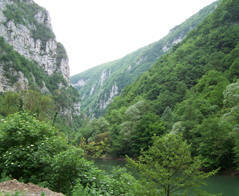 The drive north to Banja Luka goes through the attractive Vrbas Gorge. 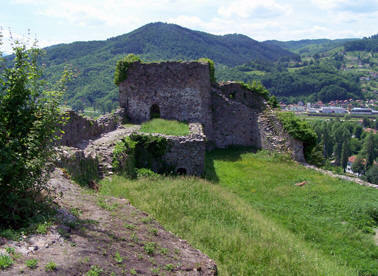 There are several ruined forts including Grebengrad below. 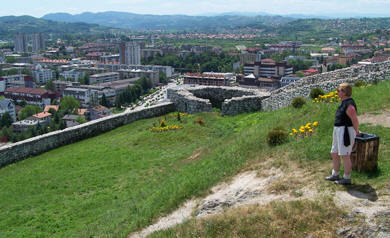 A central base for touring Northern Bosnia is the administrative capital of Republika Srpska, Banja Luka. 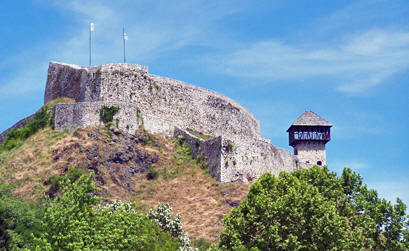 The highlight is the well preserved Tvrdava Castle on the banks of the Vrbas River. 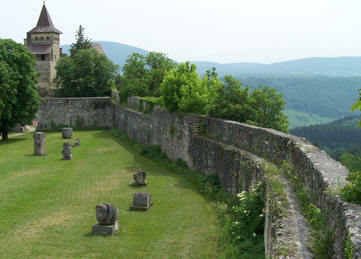 The highlight, and possibly the finest castle in Bosnia, is Ostrozac near the town of Cazim. 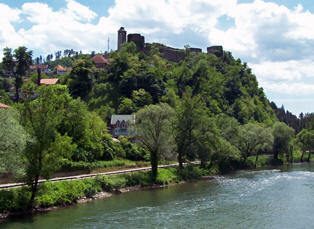 It formed the Austrian border before being captured by the Ottomans and is situated on a high bluff above the Una River. 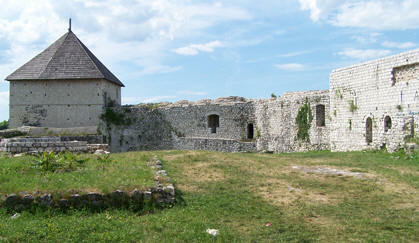 It is well preserved despite bombardment from Serbian 120mm mortars in the recent conflict. 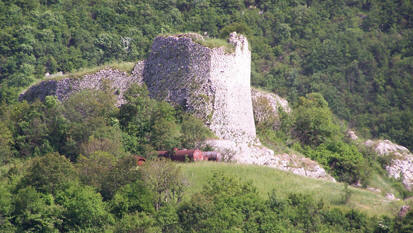 South of Doboj is Maglaj. 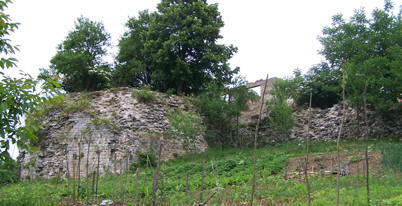 The fortress is currently being renovated. And finally Tesanj. 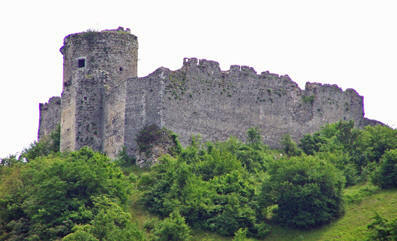 This was the seat of the Bosnian noble Krstic family who held it until 1476. Then the Ottomans, most famously Gazi Ferhad Bey. and that ends the tour. 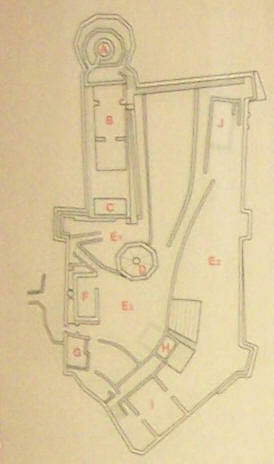 As always if you need further pictures interior or exterior of castles etc contact the editor. 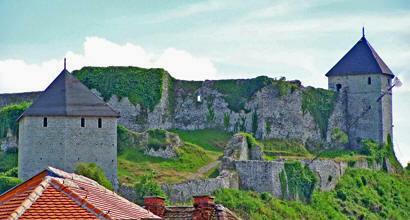 There is only one English language guide to BiH and that is the Bradt Travel Guide written by Tim Clancy. There are regional guides published by local publisher Buybook written by the same author but these are largely a rehash of the Bradt guide. The guide is generally very good and his recommendations were sound. Modest criticisms would be the poor street maps with the street names of places he recommends being omitted. Plus vague descriptions like Sokolac being 'close to town' is less than helpful. There is public transport but realistically car hire is the only practical way to tour this country. Road condition is better than I expected but remember it is only single carriageway in mostly mountainous terrain, so journey time is painfully slow. 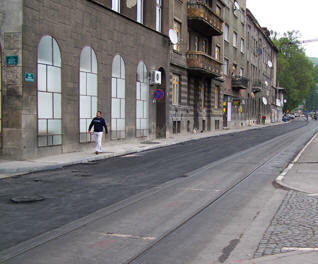 You will trail behind many concrete mixing trucks! The hotels were good. 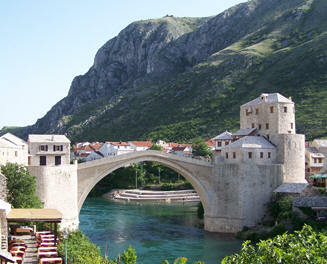 We used the Hotel Bristol in Mostar, Hotel Saraj in Sarajevo and Hotel Palace in Banja Luka. The food and drink is also excellent and cheap. Even the best restaurants are less than half UK prices. 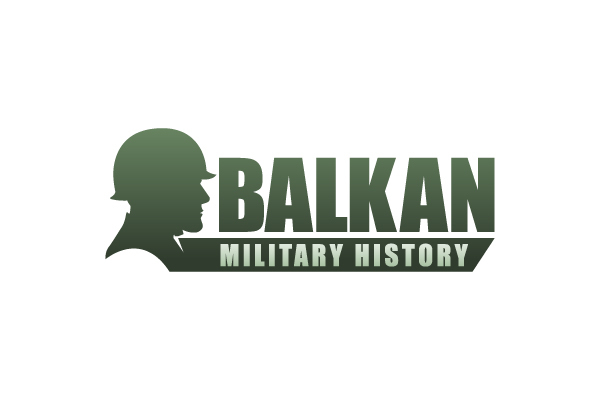 I would particularly recommend the Babylon and Hindin Han in Mostar, the castle in Banja Luka and pride of place the Dveri in Sarajevo (Prote Bakovic 12, Old Town). Their home made bread is the best I have eaten. The essential read is Noel Malcolm's Bosnia - a short history. For the medieval period in more detail John Fine's volumes Early and Late Medieval Balkans. For a better understanding of the Muslim population read Mark Pinson The Muslims of Bosnia-Herzegovina. For the recent conflict Branka Magas War in Croatia & Bosnia 1991-95 and Tim Ripley Operation Deliberate Force.